The observation by Barack Obama that he (and probably his successor, whatever their stripe) would prefer Britain to remain an EU member state has not gone down well with all those who work in the service of Creepy Uncle Rupe, who bows to no man in his detestation of any Democratic Party politician. 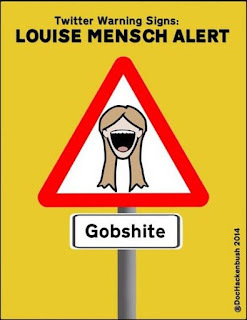 So it was no surprise to see (thankfully) former Tory MP Louise Mensch dutifully kicking the Prez in her latest Sun column. We can read all of the tedious drivel as her witterings are not considered worthy of putting behind the Sun’s paywall, right from the headline, “Disastrous, weak Obama might as well quack it all in … We don’t need to listen to him on EU”, to the lame “SO Barack Obama thinks the UK needs to stay in the EU. ‘Quack quack, special relationship quack,’ the US president reportedly said … What? Sorry, I was translating it into ‘lame duck’ — what they call a useless politician on their way out”. Laugh? I thought I’d never start. It’s just lies and spin, from beginning to end. “He said we need to bow to Brussels”, she claims. No he didn’t. “Nobody paid him any attention over Greece’s debt crisis”, she wibbles. Not a US issue. “He did sod all to stop President Putin when he invaded the Ukraine”. It’s not called “the Ukraine”, and what does she want the US to do? Start World War 3? “Obama even allowed Russia to host fugitive whistleblower Ed Snowden”. Terrible, eh? The USA doesn’t stick its bugle into other countries’ internal affairs. But then it gets seriously stupid. “He wrapped up with [?] an Iranian ‘deal’ that will do nothing to stop the mad mullahs developing nukes”. The Iranian “deal” - not yet finalised - provides for an unprecedented level of monitoring, and, yes, stops Iran “developing nukes”. Can’t she get one thing right? Nope: “some brave Navy Seals killed Osama Bin Laden in 2011, in an operation started by President Bush”. Yes Ms Mensch, it took the Navy Seals two and a half years to get to northern Pakistan. How about health care reform? “Even at home, his Obamacare health programme is unpopular”. Yeah, right. That’s why the percentage of US citizens without cover is at its lowest ever. Let’s cut the crap: only the most wilful and blinkered right-winger can fail to concede that Obama has been one of the great Presidents. Quite apart from bringing Iran in from the cold and effectively pointing the country to the west, he has ended the pointless stand-off with Cuba, bringing that country into the mainstream for the first time in over 50 years. And Ms Mensch’s claim that he’s doing nothing on Syria is also bunk. Otherwise, how did all those US warplanes get there? His approval ratings, which one might expect to be poor for a Prez late in the second term, are holding up well. Even now, there are new initiatives: “Executives from 13 major U.S. corporations will announce Monday at least $140 billion in new investments to decrease their carbon footprints as part of a White House initiative to recruit private commitments ahead of a United Nations climate-change summit later this year in Paris”, announced Bloomberg news today. While Louise Mensch sits there in her upmarket Manhattan bunker, the world has moved on. Meanwhile, her puerile sniping shows just how out of touch she is. Sad, really. I'll just remind everyone, of the words of G.W, when asked about OBL. "I don't even think about him". The rest of her remarks are cobblers, unlike her mates Tony and George, I suspect he can visit all over the world and it not end up in a massive demonstration and riot. I wonder what she makes of the immigrants who work in the UK and remark that they reckon Dave, Jeremy and George are lying toad(ie)s. Reddit, reddit? Tim, She's not "out of touch." Quite the opposite. She's well in touch with the crack-brained econofascist agenda, which is why she does her Riefenstahl impression every time Murdoch and Kavanagh give her the chance. Even by tory "standards" the woman's on Planet Loon, New York branch. That's the one out in the Kuiper Belt. In my book Obama has been a massive disappointment. It's made worse by the fact that he's an obviously intelligent man (in contrast to the utter moron who preceded him in office). I thought too that his experience as a discriminated-against black man in racist USA would make a massive difference. But it didn't...the difference has been only marginal. The USA is still the world's leading mass-murdering Rogue Nation - it is not "indispensable" or "exceptional" in any other way. 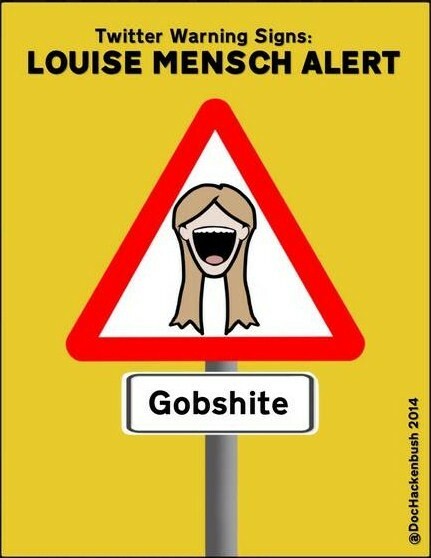 Menschen is well matched with New York. She's a sort of down market female Del Boy trying to be an even more down market Gordon Gekko. In other words, certain to be employed by that balding old thug Trevor Kavanagh. Obama, for some bizarre reason, doesn't fit into the Murdochian view that the Anglosphere (meaning USA, UK, Canada, Australia, NZ) should be able to do whatever it damn well wants, in particular bombing some manners into uppity foreigners. I'm really at a loss why. What is it about him that makes the Murdoch squad so uncomfortable...? Wonder what she makes of Peter Oborne's contribution to the Beeb Magazine today. Where he infers that our President, sorry PM, is encouraging extremism by "colluding" with HSBC to close certain bank accounts. "According to one senior government official: "There is a definite connection between the bank account closures and the review of the Brotherhood." "By sending the message to law-abiding Muslims that they are excluded from the simple privileges enjoyed by all other British people, we risk encouraging rather than suppressing extremism."